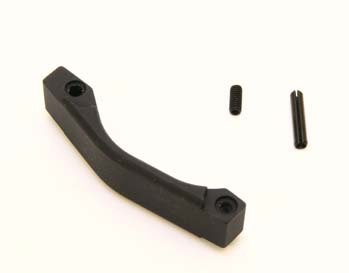 The Enhanced Trigger Guard is a black anodized aluminum drop in replacement for the AR15/M16 weapons platform. It features a shallow "V" shape for better use of gloves in tactical shooting or cold weather operations. The Enhanced Trigger Guard is non-folding, has rounded edges, and fills the annoying "gap" at the rear of the standard trigger guard. All mounting hardward included.